Push the seats in the second row forwards as far as they will go . Push the backrest release in the direction of the arrow and fold the backrest forwards until you hear it engage . Adjust the seats in the second row in such a way that they are a sufficient distance away from the head restraints of the folded-forward backrest of the third row. 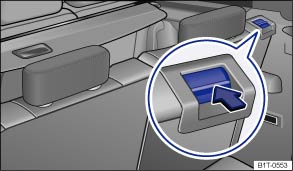 In vehicles with a natural gas engine, the seats in the third row of seats have a carrying capacity of max. 35 kg each. Failure to observe this limit will exceed the maximum permitted rear axle load .